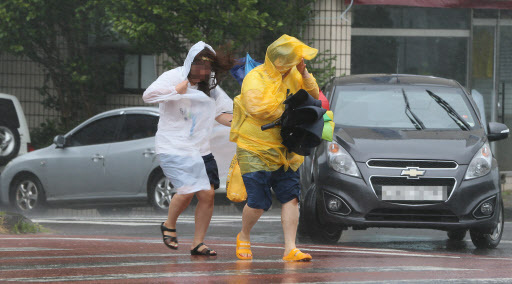 The powerful Typhoon Soulik has been fast approaching the Korean Peninsula since Thursday morning and is expected to hit the country with strong winds and heavy rain. As of 9 a.m., the typhoon was located 90 kilometers west of Jeju Island with winds of up to 37 meters per second. The Korean Meteorological Administration said that Soulik would pass South Jeolla Province around 3 p.m. Thursday and Seoul around 9 a.m. Friday. A total of 1,493 schools nationwide have been closed due to the powerful typhoon, while 599 schools shortened school hours Thursday. The number of closed schools will increase as most parts of the country are projected to be affected by Soulik through Friday. According to local media reports, a total of 6,848 households on Jeju Island have suffered blackouts as strong wind damaged electric wires. Soulik also destroyed 37 traffic lights on the island. 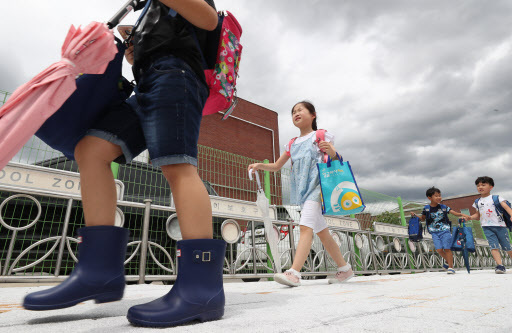 As the typhoon moves toward the country, residents in Korea have been actively sharing details about the weather-related situation via social media. The keywords “Soulik” and “real-time location of Typhoon Soulik” have been sweeping internet portal Naver’s trending bar since Wednesday. Other keywords such as “school closure” and “Gimhae Airport” also appeared on the trending keyword bar. A tweet that included a picture of Soulik’s expected path has been shared over 15,292 times on Twitter and received more than 2,500 likes in two days. Another Twitter user advised others to brace for the typhoon, saying “We only live once, right? Let’s postpone our vacation plans to prevent possible damage. Also, remember to prepare emergency food and water in case of sudden blackouts or water shortage!” The tweet has been retweeted more than 28,000 times and received 5,800 likes. A tweet by the Ministry of the Interior and Safety warned residents to check out safety tips before the typhoon hits. According to the tips, people should frequently check weather conditions via the TV, radio or internet. Windows should be secured tightly on the frames with tape. Cars parked in underground parking lots should be moved to a safe place, and residents should prepare flashlights or candles in case of emergency situations. The presidential office Cheong Wa Dae also warned of the dangers of the typhoon via its official Twitter account and told the public to stay safe. Its tweet included a link to the Korea Meteorological Administration’s website, which updates data on the weather in real time. “This is what’s happening on Jeju Island right now. 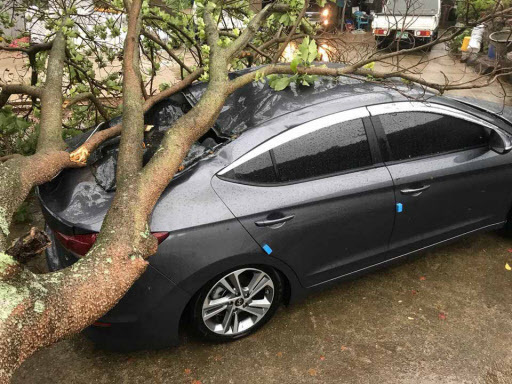 It looks so dangerous,” a Twitter user wrote, posting a 10-second video that showed trees falling on the streets due to the wind. The tweet has been shared nearly 3,000 times in 18 hours.